Manufacturer Part Number: BCPR6E. Model: MUSSO. Short Code: 1269. Make: SSANGYONG. NGK SPARK PLUGS FOR CARS > NGK STANDARD SPARK PLUGS. Engine Type: 24V V6. Product Type: SPARK PLUG. 100% SECURE. SSANGYONG MUSSO (FJ) 2.0 93kW dal 10-1996 al - [Anno fino a[=>]12/2005 -- Tipo carburante[=>]GNC/GPL -- Sostituire dopo km[=>]30000]. Informazioni sul Sistema Accensione BOSCH. OPEL[=>]55564962. OPEL[=>]32017048. SSANGYONG MUSSO (FJ) 2.0 93kW dal 10-1996 al - [Anno fino a[=>]12/2005]. SSANGYONG[=>]0031596703. Informazioni sul Sistema Accensione BOSCH. PROTON[=>]96037952. PROTON[=>]96070659. PROTON[=>]MS851351. Model: Musso 3.2i. Material: Yttrium Enhanced Copper Core. Make: SSANGYONG. BOSCH SPARK PLUGS > SUPER PLUS. Bosch Short Code: 6. Plug Type: Super Plus. Part Type: Spark Plug. Warranty Period: Manufacturer Warranty if applicable - See Bosch website for more details. 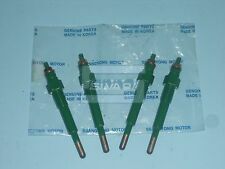 Multiple choices exist for:SSANGYONG MUSSO Spark Plug Plug. FOR SSANGYONG MUSSO. For Cylinder:2 4. For Oe Number:000 159 3642. Part specifications. Vehicle compatibility. This is an original quality part manufactured by Trucktec Automotive. 5 X MONARK BUJÍA INCANDESCENTE / BUJÍA INCANDESCENTE. Calidad alemana de Hamburgo ! 0 100 220 176. 661-159 31 01. 001 159 00 01. 001 159 99 01. Original NGK Zündkerzen. Neuteil, wie abgebildet. Ozinox 104983 # 9-7-C-3. SSANGYONG 1721590003 A 172 159 00 03 A1721590003. SSANGYONG RODIUS 3.2 MPV Petrol 05/2005 on RWD 24 220 162. Spark Plug Fixed SAE connector, Nickel Middle Electrode, 1 - Earthed Electrode, no interference suppression, with gasket seat. DAEWOO MUSSO (FJ) 2.9 D 4x4 01.99 - 09.99 73 99 2874 8251-303. DAEWOO MUSSO (FJ) 2.9 TD 4x4 01.99 88 120 2874 Bj. bis 12.00 8251-312. Glühstiftkerzen sorgen für komfortables Starten, stabilen Kaltlauf und dadurch geringere Emissionen.